It's out at the end of the month. Rime, lest we forget, is out May 26th, and us fans of ICO, Wind Waker, Studio Ghibli and other similar things are sure looking forward to setting sail for this island-based, puzzley adventure. If you've decided you're not quite excited enough, or you're teetering on top of a fence right now, you might be interested in the latest developer video diary, which goes into detail about Rime's puzzles, exploration elements and animation. It doesn't seem to spoil anything from Tequila Works' game, so I think it's a safe watch. Man, I love islands in games. This particular one reminds me a lot of The Witness (although I very much doubt that its more hands-on puzzles will be quite so difficult). 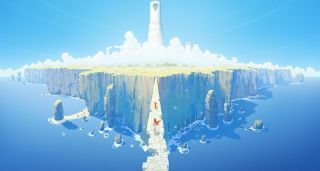 The main motif of Rime's environment design, which you can even spot twice in the thumbnail above, is the big tower with the ginormous keyhole at the centre of the island. The developers talk about this in the video, but stop short of revealing how you'll find a key massive enough to slot inside.